For almost 30 years, Mark Madden has led or served in roles for some of South Carolina’s most impressive environmental efforts. 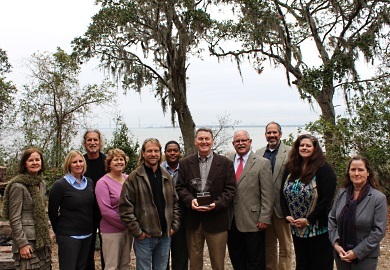 This week, Madden was honored with the 2015 South Carolina Environmental Awareness Award, recognizing outstanding contributions made toward the protection, conservation and improvement of South Carolina’s natural resources. Madden currently serves as the interpretation and stewardship manager for Charleston County Parks and Recreation Commission (CCPRC), where he also got his start as the Commission’s first full-time naturalist in the early 1990s. Over his career as an environmental educator, Madden has delivered environmental programming to over 10,000 people and reached an estimated 1,000,000 people through exhibits, cell tours, and other materials he has developed for South Carolina parks and museums. In addition to his work with the CCPRC, Madden played a significant role in starting the Charleston chapter of the Master Naturalists program, shaping a world famous eco‐community (Dewees Island), and improving one of the state’s largest greenways (Anne Springs Close Greenway). “Mark has worked passionately to promote environmental awareness in South Carolina for decades, and his work will have a tremendous and continuing impact on so many people in our state and beyond,” said S.C. Department of Natural Resources (SCDNR) director of environmental programs Bob Perry, who presented the award on behalf of agency director Alvin Taylor. Established in 1992 by the S.C. General Assembly, the award is now in its 23rd year. Each spring, the public is invited to submit nominations that are then reviewed by an awards committee, which includes representatives from the state’s natural resource agencies. In judging nominees, the awards committee considers excellence in innovation, leadership and accomplishments that influence positive changes affecting the natural environment. The awards ceremony this year, originally slated for October 6, was postponed due to Hurricane Matthew. Members of the awards committee represent the S.C. Forestry Commission, S.C. Department of Health and Environmental Control, S.C. Department of Natural Resources, and S.C. Sea Grant Consortium.